During the Battle of Hoover Dam (Part Deux), ED-E floats behind me while I navigate the ramparts and depths of the dam, exchanging fire with the forces of Caesar’s Legion in their throwback regalia. Arcade follows as well, lugging around a giant bludgeon as effectively as one expects a pacifistic surgeon to do. He often falls unconscious. After activating an army of killer robots to help liberate New Vegas from both the New California Republic and the Legion, I go to fight the remnants of both armies. The Legate and his fist-punching hordes put up a fight, incapacitating both of my companions, but I’m Annie Blacktop—I don’t really need their help. I rain hell on the Legate until he explodes. When my companions revive, I head to the gate. A representative of the NCR is there. There are options of peace I scroll through, but I can’t take his bad attitude. Even though he’s surrounded by an army, he talks trash to me, personally blaming me for all the mayhem. After I’ve taken enough of his abuse, I shoot him in the face with the Rat Slayer, because I hate him. His head explodes in a spray of blood and, presumably, bone and brain. His men open fire and are immediately Swiss-cheesed by the army of robots surrounding them. I don’t even get to take aim. I admittedly feel some guilt, since the grunts did nothing particularly wrong. The credits roll. It turns out I’m not a savior. I’m not a tyrant. New Vegas rolls on without me and I’m just kind of there. That seems about right. There is little sense of accomplishment because I don’t seem to care. My head hurts and my stomach aches and I have the feeling I’ve made a mistake. I should have listened to Leigh and Greg. I’m not someone for whom moderation comes easily. I eat too many slices of pizza; when I watch television, I binge-watch seasons of Buffy or Arrested Development; I run too far (and hurt myself); I drink too much coffee/beer/water; I take on too much responsibility; I commit to too many celebrations. It’s a problem in everyday life that gets exacerbated when I fall in love. My first love was with Twix. Twix, to those who live in caves, are twin bars of chocolate plus caramel goodness. I got them for the first time while trick-or-treating in 1988 (I was dressed as Link from The Legend of Zelda). At the first bite, I knew there was something special. The crunch, the gooiness, the flavor sensation. I’d never experienced anything like it. I had to have more. She must have intended to teach me a lesson, because she in no way enforced her command and I proceeded to force every stick of chocolate down my gullet in a frenzy. When I was finished, my mouth was covered in chocolate and my stomach bulged slightly. I wish my contentment had lasted longer, because no sooner did I finish than I bounced up, rushed to the bathroom and vomited everywhere. Never again, I vowed. Of course, that lasted until the next obsession came along. Because, again: moderation really isn’t my thing. I get occupied, enamored, obsessed. In my teens, I discovered pot and spent the better part of a decade stoned. Just last year I spent several months buying and selling GI Joe figures from the mid-‘90s for no particular reason. When I discovered fantasy football in 2010, I spent dozens of hours a week poring over the waiver and reading essays and articles about how to win. I had a few years where I really liked ties and I now have a collection of several dozen (of which I wear five or six regularly still). There’s often a penalty to this lack of moderation. Sometimes it’s as simple as throwing up too many Twix. Not a big deal in the scheme of things: twenty-eight years later, I still enjoy the occasional Twix. But sometimes the obsession has a touch of ruination. I played it out (like pot, or GI Joe). 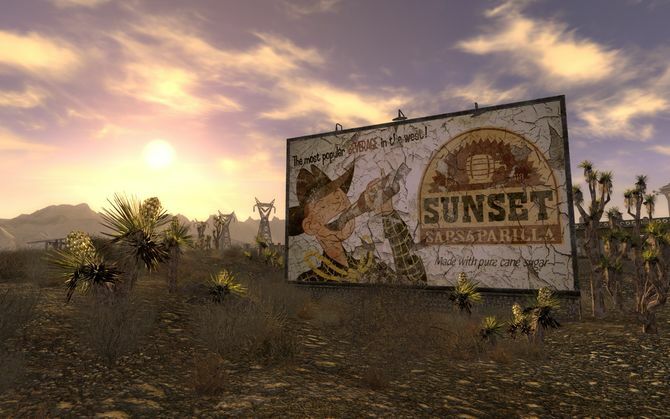 Which brings me back to Fallout: New Vegas, a wonderful game that I’ll hear no argument against. The design is a small step up from Fallout 3, but a step up nonetheless. The colors, when not traversing the Mojave Wasteland itself (full of browns and browns and browns), are crisp and sweet, the controls responsive and intuitive. Crows fly at regular intervals. Water gurgles. It’s often quite lovely. There’s dark humor and overt sexuality, sometimes combined. 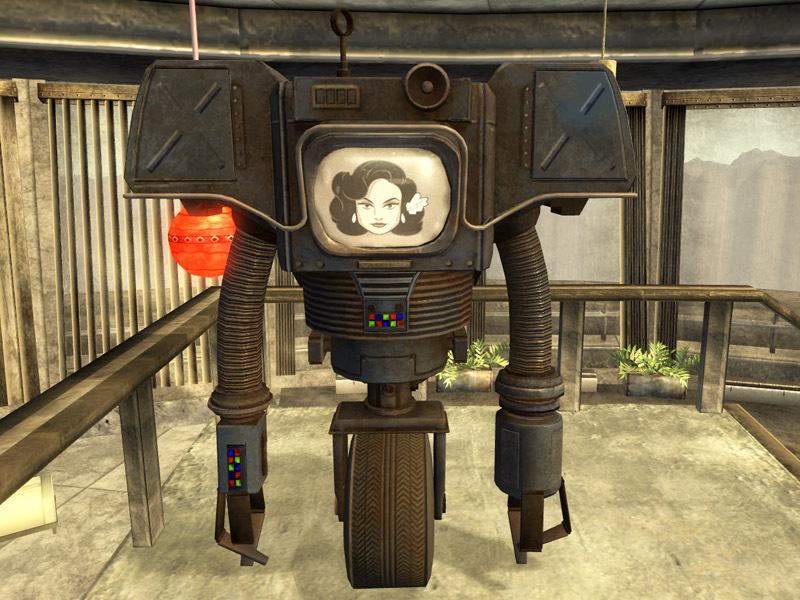 For example, when recruiting three prostitutes for a bar, I came upon a robot that I needed to reprogram as a sexbot. My avatar is a paladin-kinda gal, but when the option came up to “test it out,” I said yes, figuring that no one was around, so… I might not have expected much, but I really didn’t expect the screen to go dark, nor the weird drilling sounds that followed. A new notch on Ms. Blacktop’s bedpost, I suppose. The challenge is there this time as well. No longer is my avatar a God-person, dispensing total death with reckless disregard for safety. A well-armed room of grunts have killed me quick. So have the Deathclaws that roam the abandoned Sloan Quarry. The Legion assassins that pop up periodically have good aim and know what’s up. In sum, there’s plenty to keep my trigger finger active and keep me on my toes. It’s not difficult, per se, but it’s not a cakewalk. There’s tons of quests, too. The big letters appear at regular intervals and announce the next mission: The Legend of the Star; That Lucky Old Sun; Young Hearts. Each one that arrives gives me a little Skinner Box thrill and makes me grin. I’m task-oriented—a lot of us are. There’s that sparkle that comes when we make a list and when we check items off that list. Companions are easy to find, just challenging enough to recruit, and immortal to boot. No more reloading. They’re helpful, but not game-changers. They have their own story that can be unlocked. Fantastic. They could have thrown in a black or Hispanic ally, maybe, but from a gameplay standpoint, I don’t have any complaints. 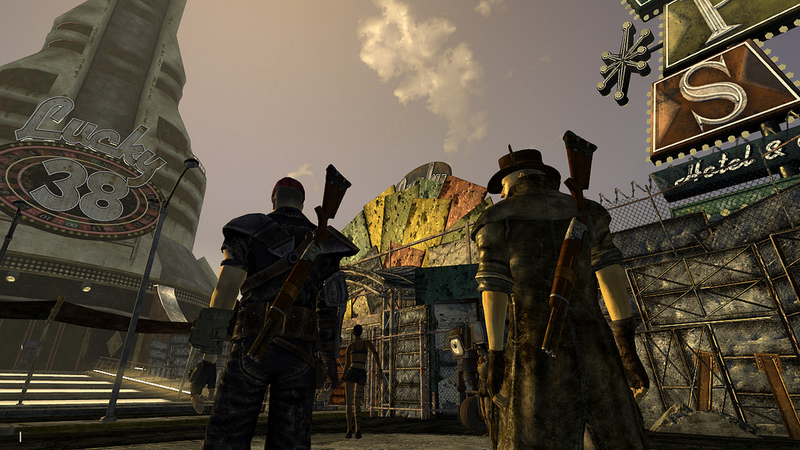 There are factions to choose from in the world of New Vegas: Do we choose to ally with the Legion, which wants to bring order to the world at the cost of slavery and rampant, disgusting misogyny (spoiler: no), or do we want to ally with the NCR, who are good-intentioned, if a bit dumb? Or do we go lone-wolf? Or do we ally with the immortal floating head? We can only pick one. I try to join the Brotherhood of Steel, pacify the Great Khans, embrace the philosophies of the Children of the Apocalypse, befriend the Boomers, keep the Caesar’s Legion happy, join the NCR and even be chill with the Powder Gangers after I murder a prison full of them. Ms. Blacktop really is my avatar; she just wants people to like her. My goal by the end game is a free state of Las Vegas, but that wasn’t always my goal; I’d initially wanted to become a part of the New California Republic, but I stopped short when they asked me to slaughter too many other tribes. The Great Khans? They sell the Fallout version of meth and crack, so I executed the entire Red Rock Canyon of them. But the Brotherhood? They ain’t never did nothing to me. Who was I going to execute next? The Boomers up on the remnants of their air force base? The Goodsprings community who offended no one but western cliché standards? Sorry, NCR, you have to go now. The choice of alliance is the story of New Vegas. There’s some rigmarole of a platinum chip and blah blah blah who cares, but really, it’s about the fate of Vegas. It’s macro and grand, without being personal. It’s intricate for intricacy’s sake. There’s an intellectual, I’m playing a game sense of fun in pitting the sides against the other. It’s novel. It’s exciting. It’s kind of hollow. But it’s not the fault of New Vegas. The memory of Fallout 3 and the magic that arose for me while exploring the Capital Wasteland was too immediate. I was Vanessa Rutledge in a way that I’m not Annie Blacktop. Part of that is the difference between political intrigue and the connection between a father and his child. But the other part is contextual and purely a part of me. “Everyone says it’s amazing,” I said. Discomfited, I asked Leigh about it a few days later. Not that she’s a gamer, but she at least knows me. “Didn’t you just finish the other one?” she asked. “I don’t have phases,” I say, knowing full well that I do. A few days later, I naysayed their nayseyery and ordered New Vegas from Amazon. And hours after I received it, I fired it up. At first, all was bliss. But it wasn’t long before feelings of unease set in, much like it does after finishing the fifth slice of pizza in one sitting. And instead of stopping, I pushed through for another 100-something hours, sort of like (to finish the metaphor) if after that fifth slice of pizza, I went ahead and ordered three more large pizzas. Trust me. The thirty-second slice of pizza tastes much worst than the fifth, even if, objectively, it’s made of the same ingredients. There’s another parallel to ruining enjoyment. Back in the early ‘90s, I read a book called Echoes of the Fourth Magic. It was about a submarine that goes through the Bermuda Triangle and encounters adventures in a magical future. If that sounds dumb, it’s because it’s a terrible concept, written by a mediocre author. But as a middle schooler, it was truly novel and exciting. As an adult, I remembered that book, hunted it down at the library and settled in to read during the first hour of a blizzard. Not an hour had passed before I put it down and sighed. I finished it, but only because I had no other books. It was awful: poorly plotted, had clumsy, adverb-filled prose, scant character development, and was filled with cliché. It was so bad that it tainted my memory of the book. New Vegas didn’t ruin my love for Fallout 3 but my modest enjoyment of it had an unfortunate effect on my overall enthusiasm. Missed expectations and all. The double-whammy of overindulgence and the failure to live up to the highest possible standards plucked a heart string I would have preferred stayed unplucked. It’s so rare that, as an adult, I get so excited with a piece of entertainment that I want to drown myself in it, that when I’m disappointed, it feels extra keen. And I have no one to blame for it but myself. The thing about obsession is that, when the obsession wears off, damage has been done. Either to myself (re: cigarettes) or, somehow more insidious, to how I feel about the object of my obsession. It’s difficult for me to listen to Radiohead’s The Bends because I listened to it daily from ’00 – ’02. Similarly, it took me over a decade to sit down and replay Final Fantasy Tactics after I logged hundreds of hours back when it came out. I’ve hurt my appreciation to go back and enjoy something I’ve loved. And that is the tragedy of too much chocolate: you’re hurting your past self’s memories and your future self’s enjoyment and even your present self’s love. Greg was right in his hesitation to play New Vegas. Not because it isn’t a stellar game (because it is a stellar game) but because he understood something about himself. He knew that if it wasn’t absolutely perfect, it would mess with a legacy he enjoyed. And Leigh was right to warn me to pace myself. She understands my tendency to burn my interests out with too much intensity. The thing about my obsessions is that they’re part of a never-ending cycle that has a tendency to hop tracks once in awhile. At the moment, I’m only obsessed with food, specifically bagels and lox. And I want to eat it for every meal. But, partially because I’m not much of a foodie, I’ve been able to withstand the full-blown temptation to indulge in it every chance I get. 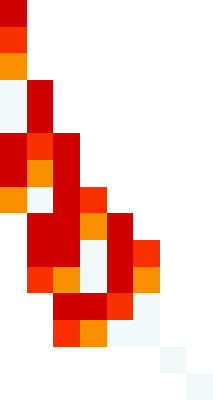 I’ll burn it out eventually, but it might take months instead of weeks (or even days). Because the other reason is that I’ve learned, at least a little, how to pace myself. I want to keep enjoying my bagels and lox, so I’m putting arbitrary limitations. I can only eat the ones I buy the ingredients for at the store; I can only eat one a week; I can only eat one after a large portion of vegetables. So far, it’s working. Fallout 4 is officially released today. I want to play it so, so badly. But I won’t. For one, I still have an enormous backlog of PS3 games to play (Mass Effect 2, specifically, has been begging for me to plat it) and have no intention of buying a PS4 in the near future. But more importantly, I want to savor the experience. I’m going to wait until years have passed and my ache to play it has dissipated. And then, only when I have the time and the mental capacity will I plug it in and enjoy, once again, the wasteland.